St. Patrick’s Day is just a few days away! Have you decided how you’ll celebrate this year? My son is currently working on his third leprechaun trap of the day (two at school and now one at home) so he’s determined to catch a leprechaun this year. We made a trap last year but all we found in the trap in the morning was some leprechaun poop (green Skittles). Ha! He’s hoping for some better luck this year. 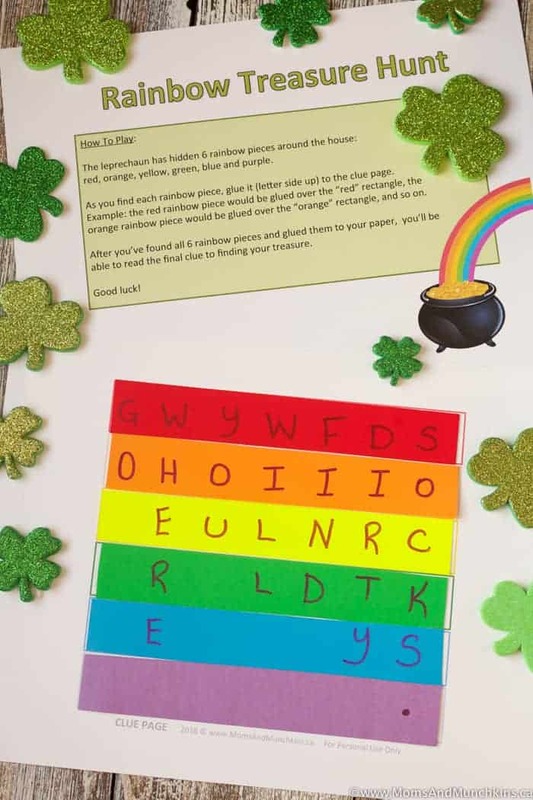 A fun idea for setting up your own St. Patrick’s Day treasure hunt at home is with this fun Rainbow Treasure Hunt. Basically, your kids search the house for all 6 rainbow pieces to uncover the secret hidden location of the treasure. Yes, we have the free printable for this! 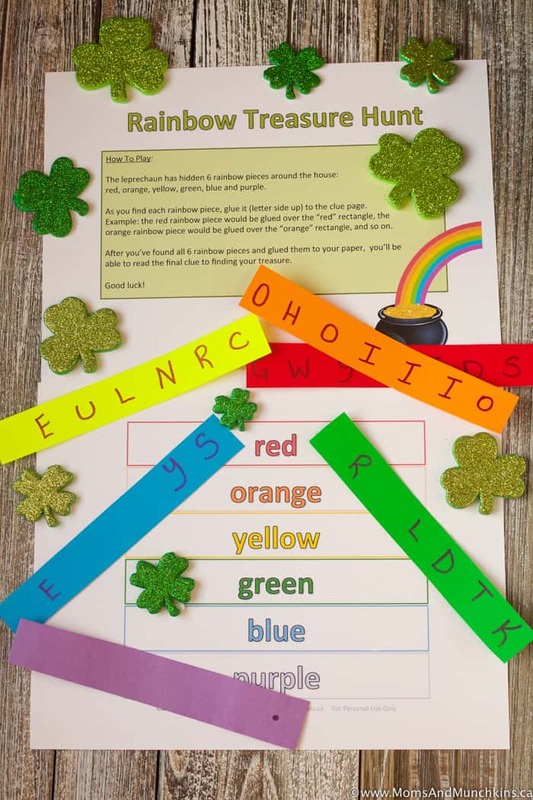 To start with, you’ll need this free printable Rainbow Treasure Hunt game. Then you’ll need 6 strips of paper, 1 inch high by 7 inches long: red, orange, yellow, green, blue, purple. Start by lining up all 6 pieces on top of each other (like on the clue page, red at the top, then orange, etc.). 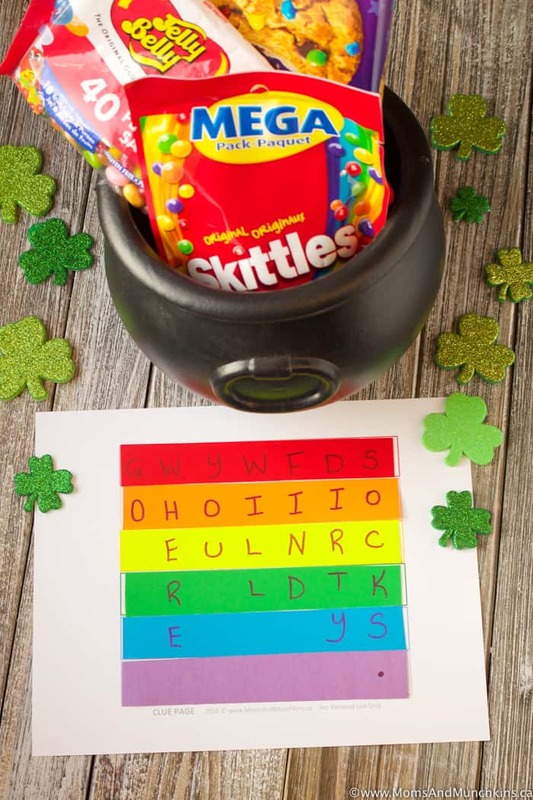 Decide where you want to hide the treasure then write this vertically across the rainbow pieces. So if you look at my example above, you’ll see that my clue (once assembled on the clue page) reads: “Go where you will find dirty socks.” The treasure could then be hidden in a place like a laundry basket or by the washing machine. You’ll then hide the 6 rainbow pieces (all in different locations) around the house for the children to find. So here’s how your kids will play. Start the game by giving them the clue card and a glue stick. As the kids find each rainbow piece, glue it (letter side up) to the clue page. Example: the red rainbow piece would be glued over the “red” rectangle, the orange rainbow piece would be glued over the “orange” rectangle, and so on. After they’ve found all 6 rainbow pieces and glued them to the paper, they’ll be able to read the final clue to finding their treasure. Make sense? Good! What will you leave for treasure? I went with a rainbow-themed treat for this treasure with Skittles, rainbow chip cookies and jelly beans. Love treasure hunts? Then you’re going to want to check out this one filled with fun Leprechaun Riddles! 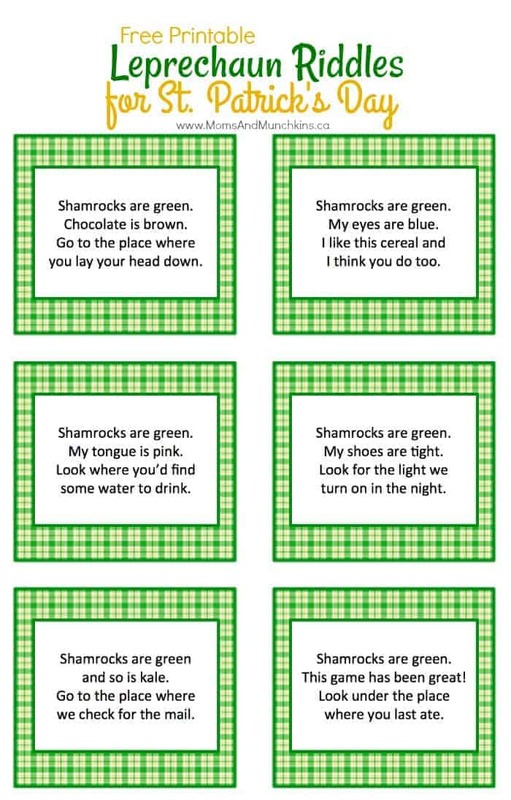 Visit our St. Patrick’s Day page for even more fun ideas like recipes, free printables, classroom favor ideas and more! Stay updated on the latest ideas for family fun by following us on Facebook, Twitter, Instagram and Pinterest.